This turmeric milk can be given to toddlers after one year. When you introduce turmeric milk to your kid for the first time, start with a small amount. 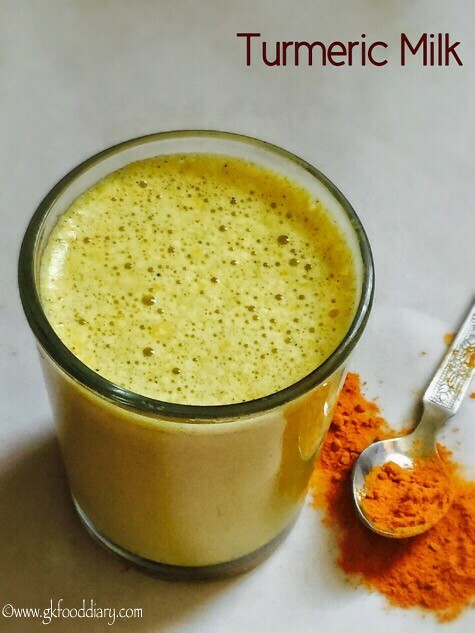 Always use organic pure turmeric powder to prepare this turmeric milk. You can offer this turmeric milk once in two weeks or whenever your child has symptoms of cold. 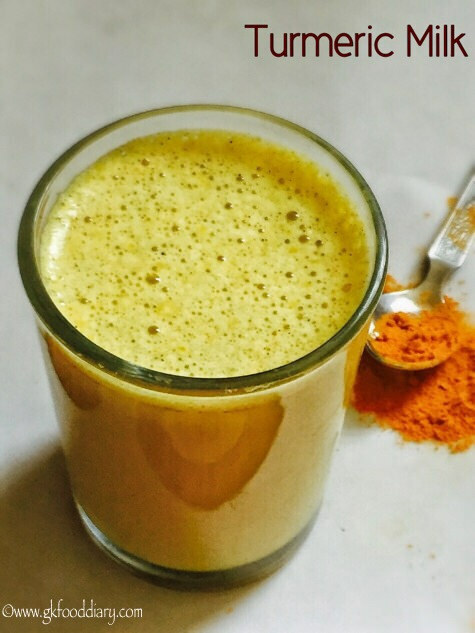 This turmeric milk is apt for rainy and winter season rather than summer. But small amount of turmeric milk can be taken during summer if your child has symptoms of cold. 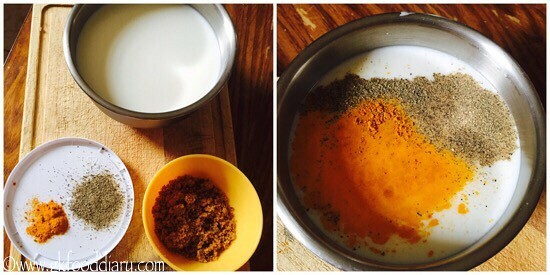 Lets get on to check how to make turmeric milk recipe for toddlers and kids. Keep all ingredients ready. Take milk in a saucepan and add turmeric powder, palm sugar and pepper powder to it. Mix well. Heat the milk in low medium flame until frothy. Transfer to serving glasses. 1. Keep all ingredients ready. Take milk in a saucepan and add turmeric powder, palm sugar and pepper powder to it. Mix well. 2. Heat the milk in low medium flame until frothy. Transfer to serving glasses. 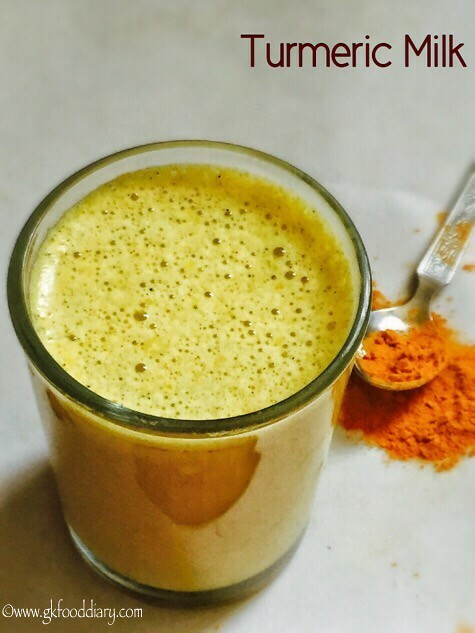 Serve the turmeric milk warm! 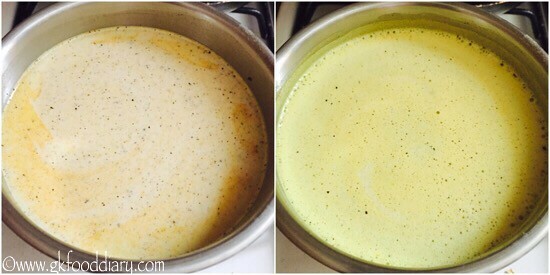 The yellow color doesn’t come initially when you mix turmeric powder with milk, but after boiling the milk with turmeric gives nice yellow color. So don’t add more turmeric powder than the mentioned amount. Instead of Palm sugar, you could use jaggery or honey. Add honey/jaggery when the turmeric milk is warm. Pepper is good for cold & cough. So it’s recommended to add it along with turmeric powder. Feel free to skip it if your child is not fond of that flavor. When you introduce this turmeric milk to your kid, start with small amount. Then increase the quantity gradually. Always check with your pediatrician before giving any new food to your child. 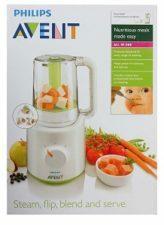 My son use only formula milk I can add turmeric , and he can drink at night? He has cold and cough! Sorry. Am not sure about adding turmeric to formula milk. yes it is black pepper powder..
Turmeric milk is traditionally prepared with cows milk, am not sure how it does tastes with coconut milk. you can give a try and see, make sure that coconut milk isn’t boiled for long. Turmeric and milk combo is belived to reduce cold. if milk is not suitable for your child, try other recipes with turmeric. Eg: Rasam. I use almond milk or rice milk. What measurement should be given to a 3 year old ? And is it okay if daily ? 1/2 -1 cup daily for 3-4 days ? I am giving turmeric milk every day to my 5 year old daughter. It won’t have side effects??? 1/2 cup to 1 cup of turmeric milk can be given during winters as it keeps the body warm.. in summer you can avoid giving it daily. also it depends on your child and body type. My entire family is suddenly very sick with a strange cold. Even my husband who usually shakes colds easily is struggling. I have a 2 year old, 3 year old and a 11 month old. I wanted to know if its okay to use this remedy for my children as well as ourselves. I’ve been doing research and someone on another site said using peppercorn (which I assumed black powder pepper was different) could cause harm to children under 3 years old. Is that true? I am glad that Honey can be used instead of Palm Sugar since I’m trying to avoid sugar altogether, are there any honey products you prefer? Hello its me again. Can I use whole milk? My nephew has cancer and he still undergoing a chemotherapy.He had just a surgery last week. Is it OK for him to take this? Sorry ..am really not sure.. please check with his doctor about this..
Hi my 18 month boy got a really bad dry cough is this good for him? And if so how much should I give him and how often? My daunghter is three years old and i am currently giving her similac stage 3 milk but now I wanted to change her milk. What milk can I give her pls advise but I am bit tesned weather she’ll drink other milk or not as she knows the tastes of similac. My son is 23 months old now. I give turmeric milk him regularly. Is it good for him or it has any side effects? Its good during winter and can be given even 2-3 times a week. You can limit it to once a week during summer as it may cause heat. My son has allergy congested nose and runny nose often daily has been going on for months. Could this help you suggest giving this milk 3-4 times a week also? Do You mean turmeric sticks?